Indian engineers are aiming to make history as construction is underway for an arch-shaped steel bridge in the Himalayas, set to be the world's highest bridge. Stretching 35 metres taller than the Eiffel Tower, the bridge is set to stand at 359 metres when construction is completed in 2016. Konkan Railway Corporation, a subsidiary of state-owned Indian Railways, an estimated $92 million. The massive steel arch is the first of its kind in India. 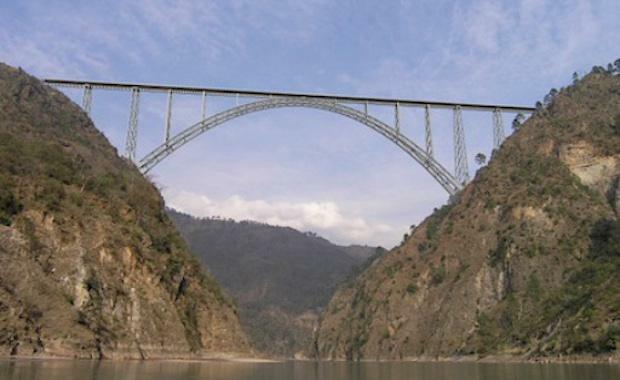 Built over the Chenab River in northern India, the structure’s height will surpass that of the current railway bridge record held by China. That bridge, straddling the Beipanjiang River, is 275 metres in height.